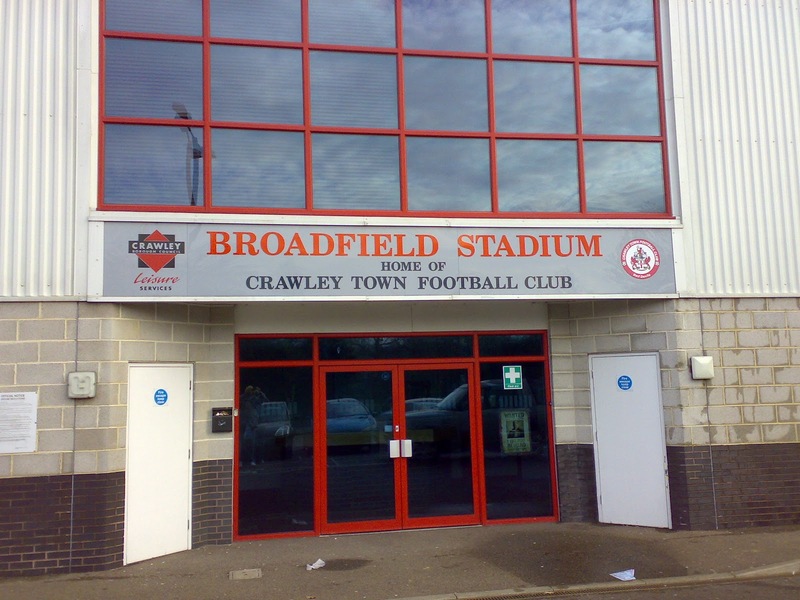 Crawley Town are a football club from West Sussex, about twenty eight miles south of London, near to Gatwick Airport. The club was formed in 1896 playing in local football before joining the Sussex County League in 1951. "The Red Devils" progressed to the Metroplitan League, becoming semi professional in 1962. 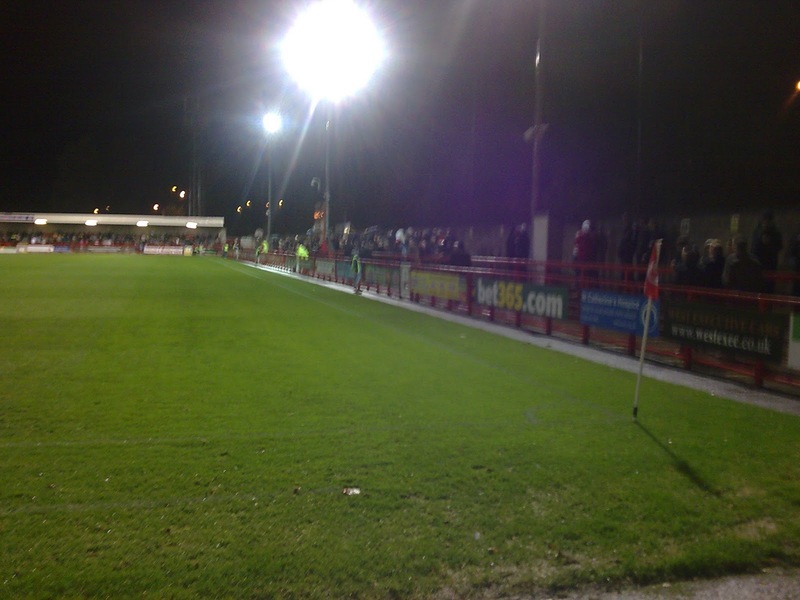 From there they moved into the Southern League where they were steady members, winning a few Cups along the way. 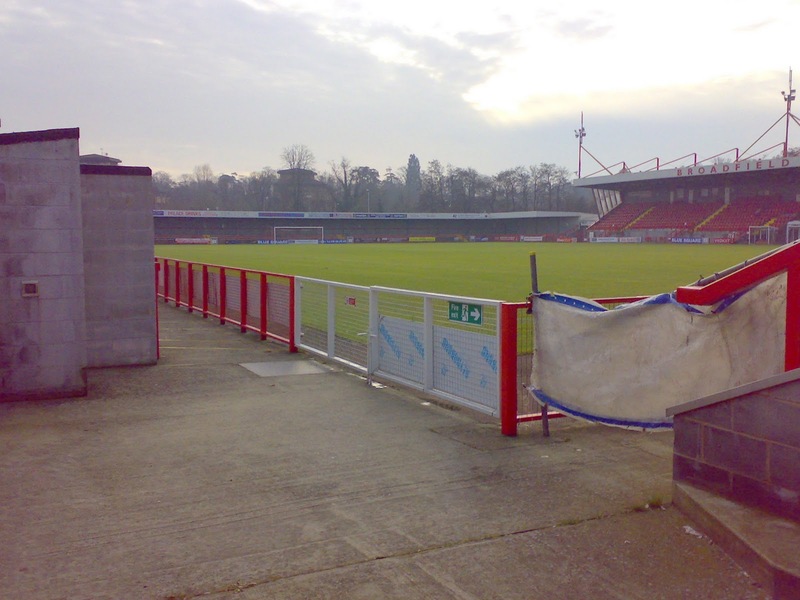 During the 1991-92 season they went on an FA Cup run all the way to the third round, before going down in a local derby at the Goldstone Ground, Brighton in front of a crowd of 18,301 against The Seagulls. 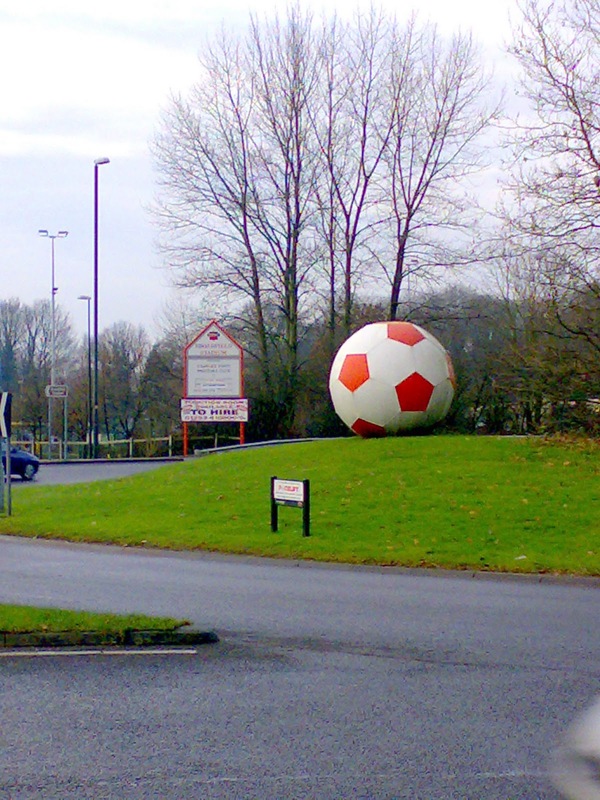 As the town grew because of growing industry in the area, so did the club. 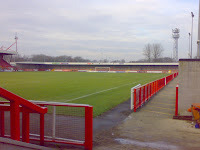 In 1997 the club vacated their home since 1949, Town Mead and moved to the superb new Broadfield Stadium, on the eastern outskirts of the town. This lead to a short period in administration a couple of years later, before a new chairman appeared. 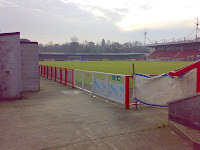 On the pitch the club moved forward under the managership of Francis Vines, who took Town into the Conference. 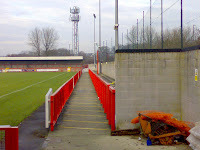 However they hit a sticky patch and owing to mismanagement the club entered administration once again in August 2006, after a last minute rescue package saved the club. The team were deducted ten points for doing so. In April 2008 Prospect Estate Holdings Limited took control of Crawley after buying it from the SA Group in conjunction with former owner John Duly. Controversial manager Steve Evans, who had earlier been found guilty of making illegal payments to lead Boston United to Football League status was appointed. 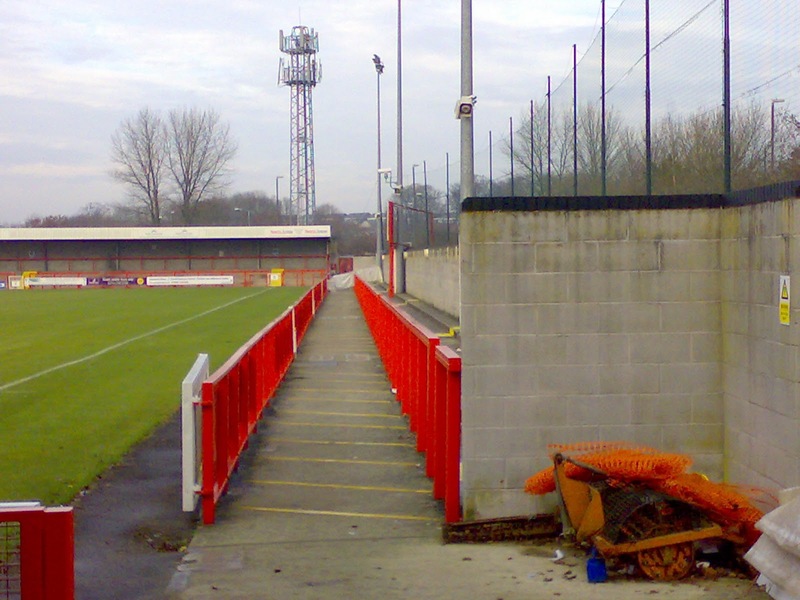 The start of the 2010-11 season saw huge amounts of money by non league standards being spent on players after new investment at the club on what was termed "Project Promotion". The project worked as The Red Devils walked away with the Conference title as well as getting a money spinning FA Cup third round tie at Old Trafford against Manchester United after defeating Derby County on the way. 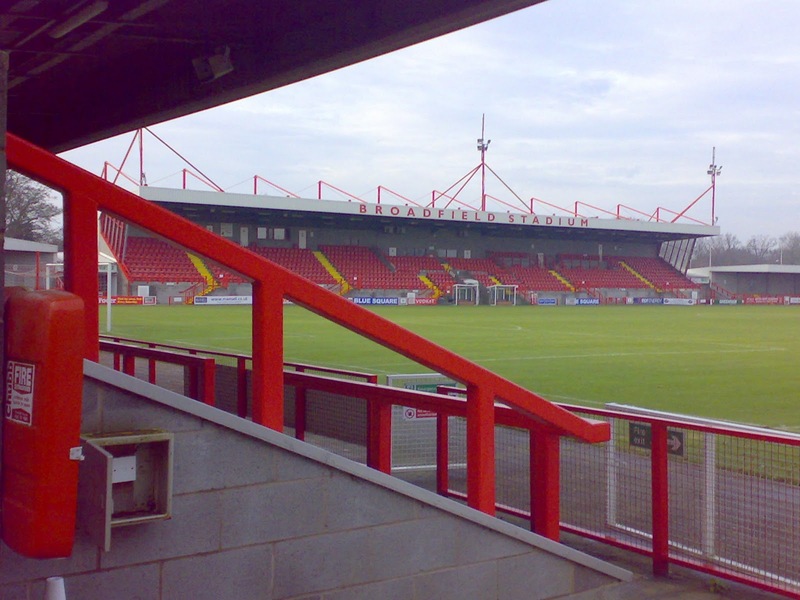 In their first season in the League Crawley won automatic promotion, even though Evans departed before the end of the season. Former Doncaster Rovers boss Sean O'Driscoll was appointed in May 2012. A new East Stand was also erected to provide Broadfield with the required seating capacity. 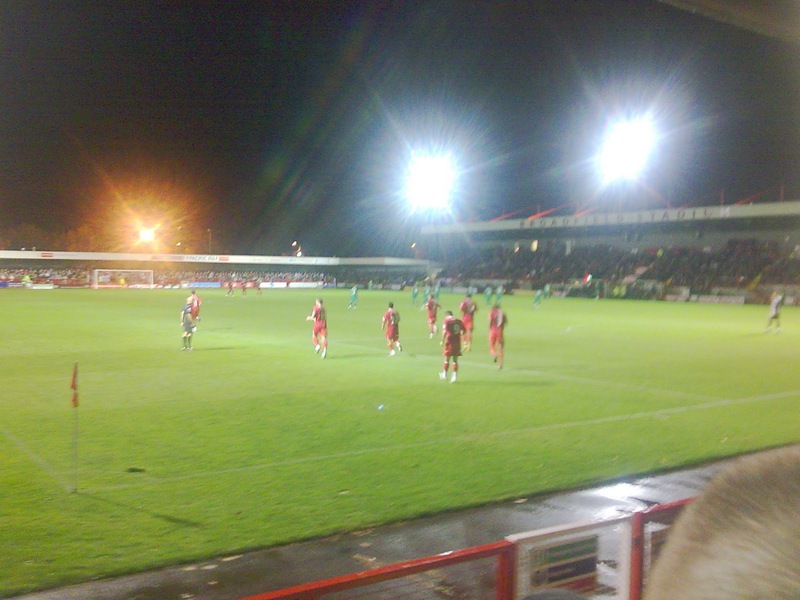 By June 2012 O'Driscoll had gone to join Nottingham Forest, with Richie Barker taking his place. This move didn't pay off as Barker was on his way by November. Former Aston Villa boss John Gregory was the choice to take the club forward. 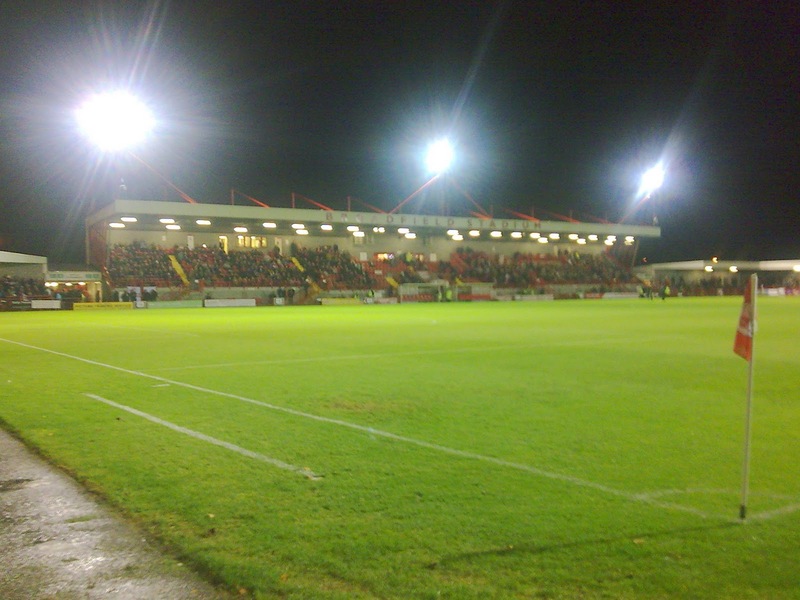 Crawley Town FC will play in Football League One in season 2014-15. 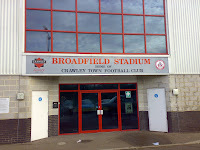 I called in on Broadfield Stadium as part of a morning groundhop in the area before going on to Horsham for their game in December 2007. I walked from my previous point of call, Three Bridges FC, which took me around forty minutes. 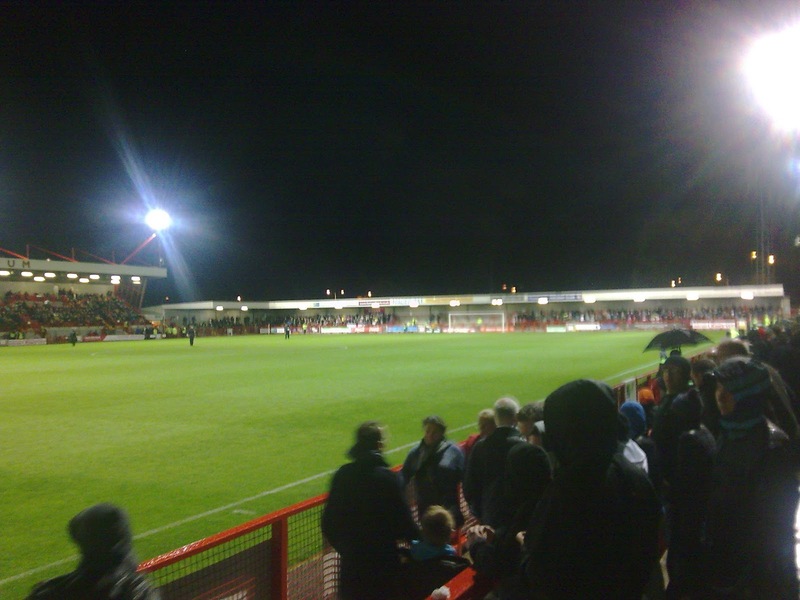 I was reminded of the walk from the station at Steveage to Broadhall Way. I'm not a huge fan of new towns and their layouts. However, I was very impressed with what I saw on my arrival. 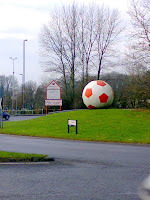 I liked the nice touch of the giant football by the roundabout near to the stadium. 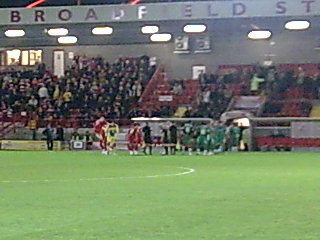 Crawley's team were boarding a coach on my arrival on their way to a Setanta Cup clash. The ground was all locked up, but I managed to sneak some good views through gaps in the gates and fences. The West Stand is a large raised cantilevered seating structure. At either ends the North and South Terraces are covered with the roofs continuing around the corner to the seated area. 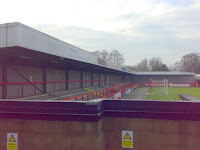 The final side is an open few rows of terracing. 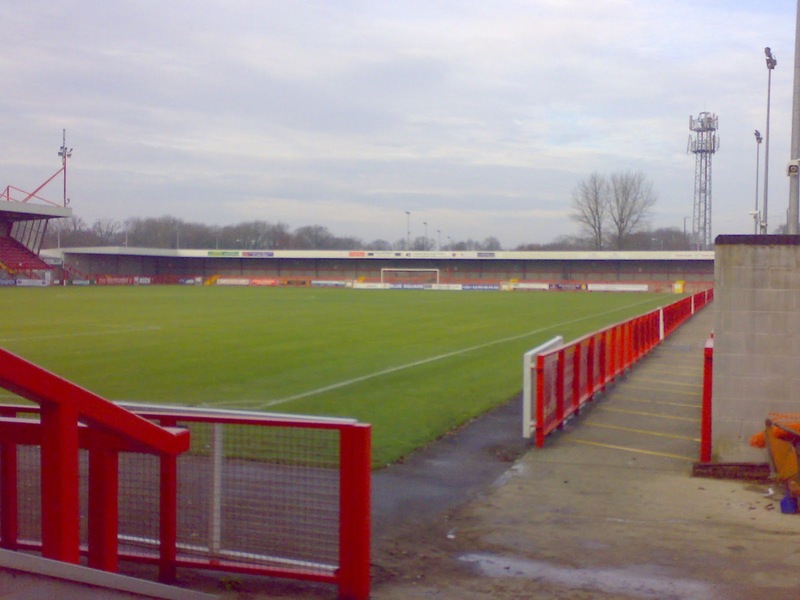 Broadfield Stadium looked an excellent venue, and would be even better if and when the fourth side has some kind of cover. I just wish it was nearer to the town centre! I decided it was time to watch a game at Broadfield Stadium as I had a vested interest in The Red Devils' performances. I had placed them in my five team each way accumulator to finish in the top three come the end of the season, along with Liverpool, West Ham United, Preston North End and Fleetwood Town. However, this was tempered slightly because of Steve Evans being in charge of the team. 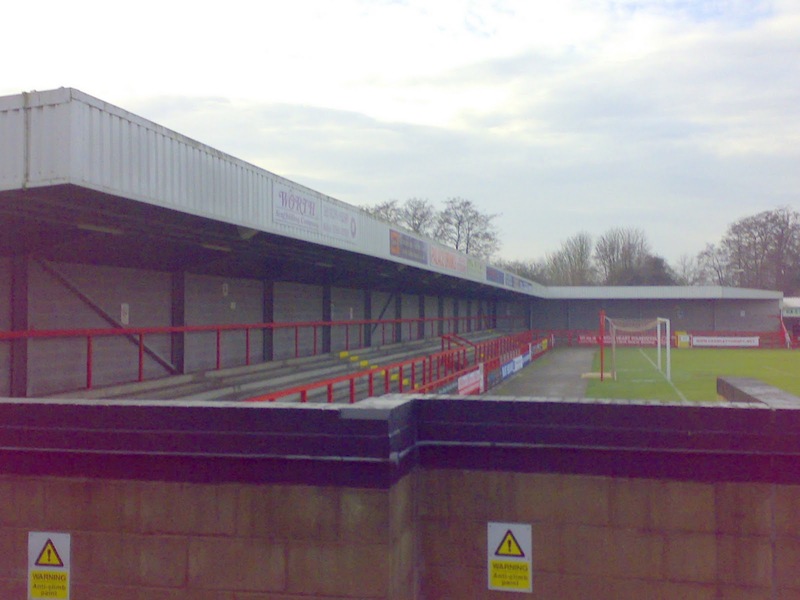 He had been found guilty of financial cheating while manager of Boston United, which saw him lead the club to the Conference title. His touchline actions also made him a very unpopular very large figure amongst most opposing fans. The fact that his Boston team beat the evenings' visitors to a Football League place would add a bit of extra spice to the match. The train from Victoria was packed as it was half term holidays. Many season ticket holders were forced to stand while families with their screaming offspring took up lots of usually available seats. I could hear the tutting over my headphones! I had done my research in advance and headed out of the station towards Brighton Road. I have to say that this was a far more picturesque route than the other option despite it being dark. After the brow of a hill I could see the glare of the floodlights in the distance and then the welcome sight of The Half Moon pub on the opposite side of the road. 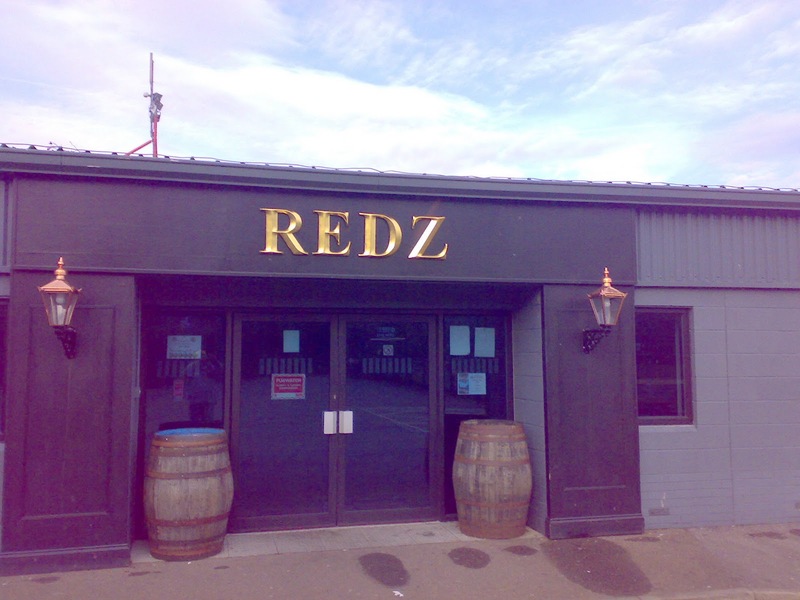 This was a decent pre match pub. 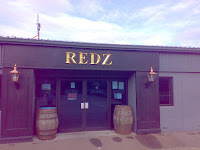 It had dart boards, pool tables, lots of TVs showing football channels, a limited food menu and best of all a hand pump. The pint of Bombardier wasn't the worst either, if a little steep at £3.50. There were quite a few away fans inside. 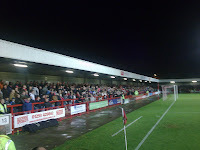 Some of the younger ones suggested staying put as the rain began to fall. I had to laugh at their Steve Evans song: 'One man couldn't lift, couldn't lift Steve Evans', all the way to ten men in the same tune as 'One man went to mow'. The doorman thanked me for my custom. I was impressed. The rain was falling quite heavily as I went down the underpass and arrived behind the Main Stand. I quickly worked out that I needed to buy a ticket from a hut before going to the turnstiles. The stewards were helpful and efficient and in large numbers. In no time at all I'd entered the South Stand down by the end of the West Stand with my £16 ticket. It looked quite busy, so I walked behind the goal to look for space. 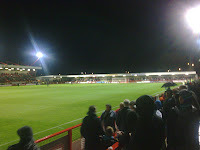 I considered standing down the open side as the rain slightly abated, but I then realised I could stand in the North Stand in the home fans section. 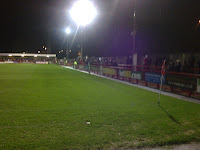 The visiting Daggers were also at that end towards the West Stand. 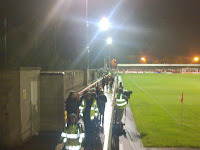 I got a decent view right at the end if the stand so I didn't obstruct anyones view. The pitch was predictably skiddy and added to the excitement. 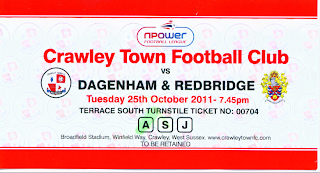 Dagenham were near the bottom of the league before kick off, with Town at the top, but a neutral would have been hard pushed to tell who was in which position. The Daggers took the lead with a long range free kick taken by West Ham loanee and son of Rob, Oliver Lee which picked up pace off the surface and embarassed Scott Shearer in the home net. I liked their style of passing football as the match progressed. Crawley on the other hand played very much route one football with long balls down the channels being their preferred method with everyone then pushing up to support. Whatever my preference, Town's style worked. Matt Tubbs got on to a John Akinde flick on only for Scott Doe to bring him down. As the last defender it gave the generally excellent ref Steve Rushton no option to point to the spot and show a red card. Tubbs cooly put away the penalty. 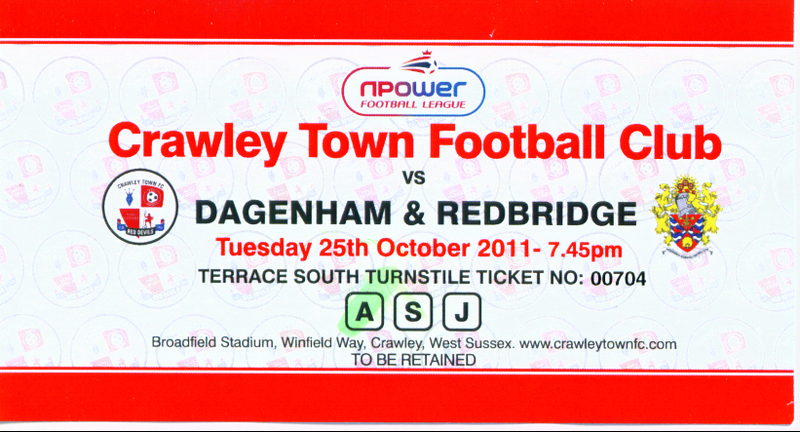 Dagenham continued to press led by the excellent Jon Nurse and only a scramble stopped them regaining the lead. Crawley continued their high tempo stuff which initially negated the whole midfield and their pressure paid off when Sergio Torres gave them the lead in first half stoppage time. 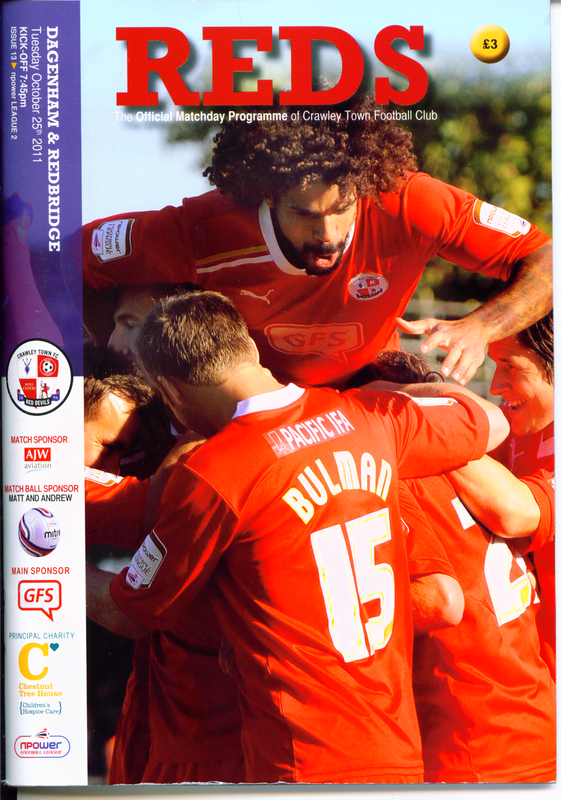 The second half was much of the same, apart from Crawley plaid a bit more build up football using their extra man advantage intelligently. Nurse continued to be a threat and had a real battle royal with Kyle McFadzean. There were several escaped for the visitors as they defended for their lives when pressed. I made my way to the far end to make a quick getaway as I had to be on the 10.01 train as I had a cheap advanced ticket. 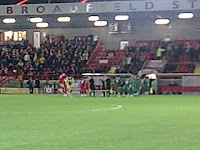 I was behind the goal when there was a huge scramble which saw the ball handled on the line. The rebound was headed home by Jon-Paul Pitman. The linesman flagged for a penalty and the defenders ushered the ref towards him. After a quick decision, the goal was awarded which I thought was an excellent decision. I wished more referees would use their common sense in such a way. I left a couple of minutes before full time and decided to walk back along the soulless Southgate Avenue to the station. It was a good walk and I was delighted to have reached the station five minutes before the train. It had been a good evening out. It was nice to be at a decent game and be able to stand up. I'd seen Crawley the previous season at AFC Wimbledon and judging on my latest viewing it would appear that the vast amounts of money they reportedly spent on players was paying dividends. They were strong, fast and powerful with some talented footballers. Just one final observation: I was astonished that the crowd figure announced was so low. 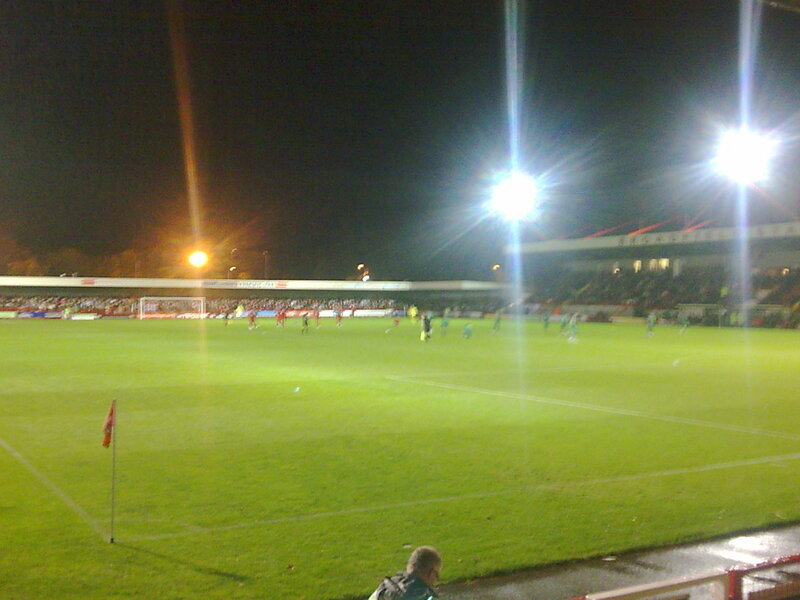 I would certainly not want to be in a capacity crowd at the Broadfield Stadium! I look forward to returning in the future when the much needed fourth stand is in place. It really will be an impressive place when that happens.